Looking for a fun and low-maintenance game to play with young naturalists or to get kids excited about nature? 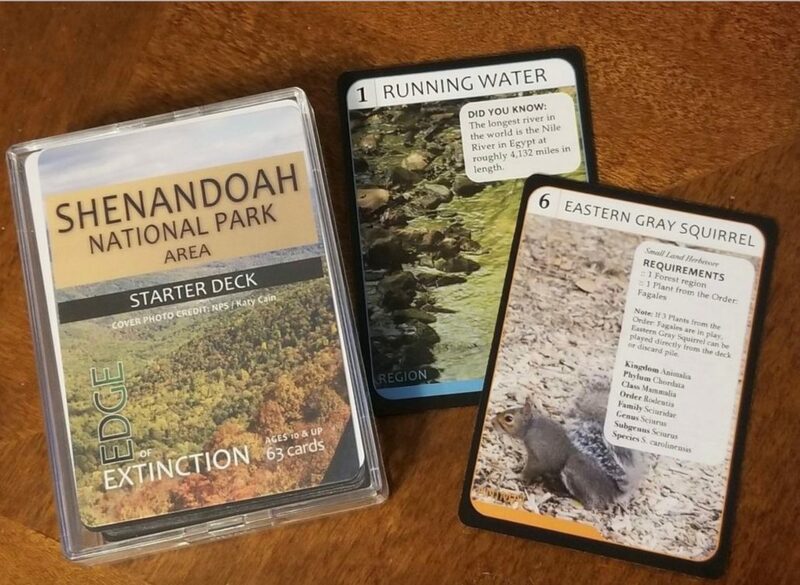 On a whim, I picked up Edge of Extinction (2017, 15-30 minutes playing time) for my kids, because visiting national parks is one of our family’s big things and anything that teaches about ecosystems is fun to us. I was afraid that it would be one of those educational tools that the kids can see right through and refuse to play. I was wrong. My three sons, nature lovers all, immediately opened their packs and started to play. And LOVED it. At first, the rules seemed complicated, but in this age of Pokémon and Magic the Gathering, the 10-year olds had no trouble. The object is to earn the most points by building the most complicated ecosystem within 10 rounds. Each player must have their own deck of cards, which represent a park or regional area. The cards depict ecological regions (e.g., forest, running water, grassland) plants, animals, fungi, and humans (e.g., botanist, woodsman) that are likely to be found in that area. Each card represents something that affects the ecosystem, either positively or negatively. Each turn, players draw a card and play as many from their hand that they can. Players start with a region, the foundation of the ecosystem. The plants are the next easiest to play, as they may simply require a region. It gets more complicated as animals require certain combinations of regions, plants, and other conditions. The human cards have powers of protection (e.g., the botanist protects ecosystems from invasive plant species.) Within several rounds, the ecosystems grow robustly. (Competitive players can always throw out a multi-player card like Early Frost to slow down their opponent.) Players learn about relationships and dependencies within their ecosystem as they play. Different decks introduce players to different species and conditions of that area. My son Logan particularly enjoys the “Did You Know” questions on the Region cards with fun facts that he can share. This game is recommended for ages 10 and up, with each game taking 15-30 minutes. The fact that the game was invented by two young nature-loving girls just makes it more appealing. My 10-year olds had so much fun with it that I ordered two more decks so my husband and I could join in. I would recommend this game as a tool for teachers to have in their classrooms as well as for young master naturalist-in-training family fun night. Want to review a resource? We’d love to hear from you. Instructions for submission await your click and commitment. We are honored. Love that you Love the game… !